Dakdongjib is a very popular dish while drinking Korea's iconic alcohol soju. It is made of chicken gizzards which are the digestive tracts that filters out rock, sand, and other foreign objects that may enter the chicken's body. 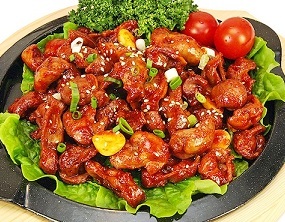 Therefore, it has almost no fat and full of muscle meat so each bite of dakdongjib can get pretty thick and chewy. This is possibly the number one reason why Koreans love this dish and new experience diners may be drawn away. It is generally stir fried with gochujang, savory garlic, onions, bell peppers, and Korean hot peppers but non-spicy versions do exist as well.